Shantrina Ealy became a mother at 15; Shane Huffman couldn’t write until 18. These are just two examples of the challenges that face hundreds of youth in San Bernardino County, a population that some may deem a lost cause. That is farthest from the truth to those who direct and oversee youth programs that aim to help them become successful, self-sufficient and productive members of society. Photo/MJ Duncan Over 600 youth who participate in San Bernardino County Workforce Investment Board’s youth programs throughout the county came together for a day of networking, listening to motivational speakers and attending career workshops. Pictured, from left, are Carlos Vasquez, 17, Academic Coach Ivan Lumba and Shane Hoffman, 23 from Operation New Hope. The San Bernardino County Workforce Investment Board held its annual Y4 event on Friday, Nov. 20 at the Ontario Convention Center where over 600 participants in their numerous youth programs throughout the county came together for a day of networking, listening to motivational speakers, and attending workshops on how to achieve career success. The event, designed by participants in the various youth programs in 2009, serves as a capstone for all the programs and presents an opportunity for youth to realize that they are part of a bigger picture – a countywide effort to provide the necessary resources to ensure opportunities are readily available for them to be successful in their careers and in life. 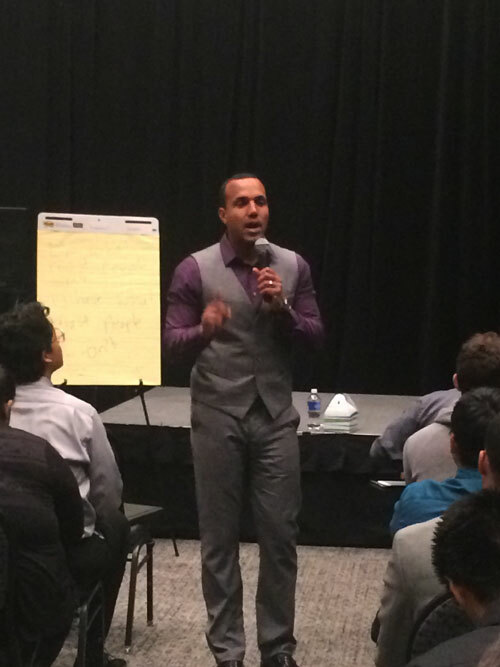 Nationally renowned authors and motivational speakers Dr. Alex Ellis and Arel Moodie were presenters at the event. The keynote speech, delivered by Dr. Ellis, “Image is Power,” highlighted how to present oneself through attire, image, character and esteem. Moodie engaged youth in dynamic workshops that included advice on workplace success and how to network for career success. Shane, now 23, is four credits from graduating high school. He has been enrolled in Operation New Hope in Rancho Cucamonga where he received vocational credits and life skills training. “I never thought I could get my high school diploma, and because of all these people (academic coaches) I’m going to achieve it,” Shane gushed enthusiastically. He attributes his accomplishments and future prospects to Operation New Hope. He is enrolled in a pre-veterinarian tech program, engaged to be married, owns a car and lives in a house with his fiancé. Photo/MJ Duncan Entrepreneur, author and motivational speaker Arel Moodie acted as the event’s emcee and also presented workshops on workplace success and networking. His dynamic sessions engaged youth who sat and listened intently to his advice that included the importance of working hard and taking the initiative, and to being the “best employee ever” and to take pride in even the most menial tasks. Photo/MJ Duncan Entrepreneur, author and motivational speaker Arel Moodie acted as the event’s emcee and also presented workshops on workplace success and networking. His dynamic sessions engaged youth who sat and listened intently to his advice that included the importance of working hard and taking the initiative, and to being the “best employee ever” and to take pride in even the most menial tasks.